Months after her partner, Jam Sebastian, had been diagnosed with stage 4 lung cancer, Michelle Liggayu had one wish for the upcoming Christmas; that her boyfriend would be healed from cancer. The couple, more famously known as JAMICH, was an online YouTube sensation who gained fame for uploading their self-made music videos. After six years of being together, the famous tandem is still going strong despite both the trials and controversies amidst the spotlight that they continuously face. salamat ! napaka galing nya.kahit wala akong bilib sa kakayahan nya sya ang bumuo ng mga pangarap namin mula bata pa kami.sya ang naging dahilan ng mga tagumpay na meron ako.sya ang dahilan kung bakit maraming pintuan ang nagbukas muli. sabi ko sa kanya ikukwento ko sa mga bata at mga tao ang kwento naming magkapatid.kung gaano nya kagaling nilusutan ang lahat ng hirap para lang matupad ang aming mga pangarap at alam ko na habang buhay nanjan padin sya sa tabi ko. hirap napo talaga sya at konting mga oras nalang po ang inaantay natin.pag pray nyo po si Jam na i welcome ni Lord sa langit na ang lahat ng paghihirap nya dito sa lupa ay maging kasaganahan naman sa itaas. March 2014 marked the time of their discovery of Jam’s fourth stage lung cancer. He began treatment, thereafter, but not with financial difficulty. 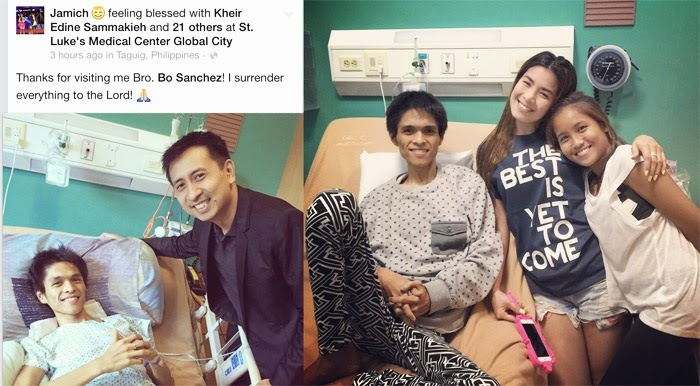 Jamich’s fans were more than generous to donate proceeds to Jam’s treatments. Just last May, the couple had been engaged after Mich proposed to his long-time boyfriend in front of their other church members. According to Jam, the happy thoughts of marrying his girlfriend and starting a family with her keep the pain at bay. Likewise, Mich’s endless hope is being fueled by their future plans together. Along with the said fame of the couple came bashers who see pretty much every negativity from their words and actions. Others accuse the couple of hogging the spotlight, and using Jam’s cancer ordeal to be more famous. There was also a time that he was bashed for posting his pictures online after his chemotherapy sessions. Nonetheless, thousands of fans still support JAMICH, particularly Jam whose physical appearance nowadays pretty much depict the hardships cancer had been giving him. His girlfriend, Mich, on the other hand, continues to show support and courage to him. Despite the emotional pain she is also experiencing, she claimed to always set it aside and show a more hopeful face to him so he could be boosted with optimism as well. Nonetheless, her statements were always toned with pleading desperation.